Working with Crystal Wings, under the student of Marcel Vogel, I have been fortunate enough to be exposed to the miraculous and awe-inspiring experiences of our clients and customers. But none have been like the feedback and testimonials from the healers that have used Ruby Lavender Quartz . There has been an enormous underground movement in the healing arts concerning this newly discovered stone. A stone that not only has been used in miraculous work, but has been calling out to all those who have been searching for it for lifetimes. 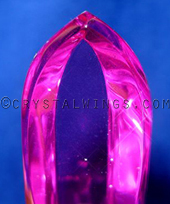 Said to have been the "Lost Stone of Atlantis" and the channeling stone of "Saint Germain", Ruby Lavender Quartz seems to have taken on a life and purpose of its own. Through the ongoing feedback from our customers and clients we have received information of the same nature concerning this stone. Across the board, the same qualities and entities pop up for every single individual in its use; unconditional love, pure heart chakra energy, St. Germain, sacred feminine, and nurturing mother energy. It seems that this 'missing stone' fills the gap and void of deep emotional trauma that we and our clients have been witnessing within, with a renewed purity of light and love. The energy of the stone itself transmutes and replaces the residual negativity and stagnancy that we hold in our heart center with a presence that many of us have not been familiar with for centuries upon centuries. Ruby Lavender Quartz dissolves ones blockages and in turn enables one to finally 'let go' and have the ability to manifest the true potentials of ones Kharmic calling. Without the walls, we become vessels for receiving and giving divine information and divine love. Ruby Lavender Quartz has truly become the embodiment of the unconditional mother, the unwavering nurturer, and the undaunted energy of love. It is the comfort of home. These tools are of extreme consequence to both our own individual selves and that of our clients. It is important to remember the need for love and wellness in our lives, and to not forget the relativity of time, and how this stone is just as familiar and powerful as it was for us in Atlantis. Give yourself the gift of an open door to the past and an evolving rush forward into the future of healing & balancing, with your own Ruby Lavender Quartz Master Healing Tool. To all who have been searching for this stone, whether it has come to you in dreams, in past life recollections of Atlantis, or if you have been worked on with this stone and wish to hold a key to your future wellness and balance, please email us at crystalwgs@jps.net. Crystal Wings proudly offers Ruby Lavender Quartz Master Healing & Balancing Tools, as the only dealer of them in the world, and quantities are limited! Shop with us online at our Ruby Lavender Quartz Store and to learn more about this amazing stone check out the article Ruby Lavender Quartz.